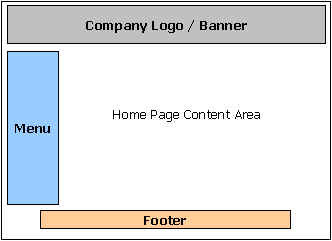 "Your website should be an extension of your business - your vision and philosophy effectively portrayed to thousands of potential Internet customers"
Designing a website is not a magical feat - the more interaction and responsibility you take for preparing the concept and the content - the more guarantee you will have that you will be satisfied with the final results. The Internet audience is different than your standard customers. You have to be able to present concise informative context immediately or you will lose their attention. On the average you can expect them to spend 3 minutes per page reviewing everything you have to offer. Do you want your website to be static or interactive? A static website presents your information much like a brochure or catalog. Not much interaction between the Website and the prospective customers. An interactive site may present the prospective customer with the ability to e-mail you, submit forms, look up information contained in a database, etc. Interactive sites may vary with the type of media they present. You can do simple forms, e-mail capabilities or you may present discussion / message boards, on-line shopping (e-commerce), streaming audio and video, etc. to your prospective customers. Interactive sites typically require programming at a lower level in the form of CGI scripts, Java scripting or FrontPage bots. Review competitor sites. Use your search engines to find 'competitor sites'. Review these sites to see how the sites are laid out, how the services/products are presented. Often times this will give you ideas for things you may want to incorporate into your site or things you may want to leave out. 'Go Surfing' - Visit enough websites to achieve the subjective intuitiveness to differentiate between a 'quality' website and one that could use some improvements. Have a feel for what you expect your website to present to your audience. Content is valuable, relevant and updated. Avoid small print and cluttered pages. Graphics are good clean images. Just a personal opinion - I don't like Frames or alot of irrelevant pop-up windows. It's hard to tell which 'Frame' is active and trying to printing from Framed pages is often frustrating. And the pop-up windows are just irritating. Who is your 'target' audience? What type of products / services are you offering? What is the image you want to present to this 'target' audience? The content of your website should be relate and incorporate all aspects of these questions. The content should be written for your 'target' audience. The Font Face and color schemes should be chosen to reflect your company image / perception. Graphics should be good clean images, that don't cause long delays in load time. The more pictures the better, you are taking the 'cyber world' and trying to present the 'visualization' of your services and or products - to make it as 'real' as possible through the Internet. 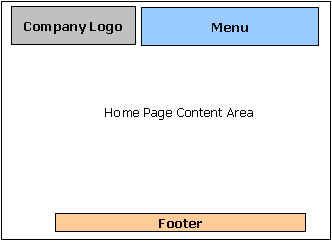 Websites have a standard set of 'web pages', the names of the pages may vary but they have a common purpose. Websites can have many more depending on how divorces the products / services are, but listed below are some of the common pages. 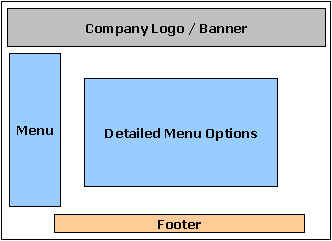 Company Information Allows you to introduce your business to your potential customers. Web Pages are sometimes called: About Us, Philosophy, History, Info, etc. Describe company vision, philosophy - reasons the customer would chose you over your competitors. Contact Information Establishes a communication channel to your prospective customer. Company name, Address, personnel, telephone numbers, e-mail links, e-mail forms. Links Used to increase Internet traffic to your website. Website links to companies that compliment your product and/or services. 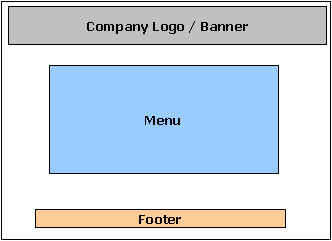 A common footer should be included that lists copyright information, an e-mail link, legal notices. This should be included on the bottom of every page.